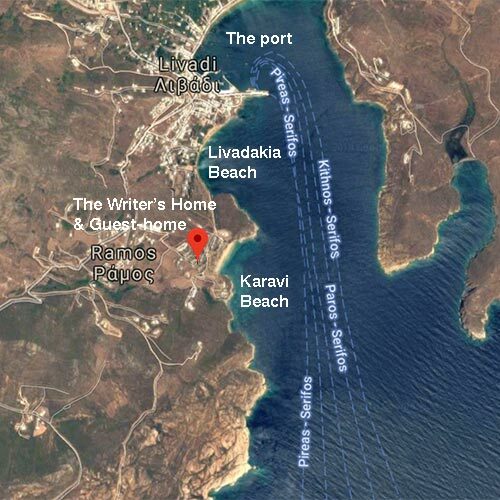 Everyone, without a single exception, had a great laugh with my desire to build a small, stone built home and a detached guest-home in Serifos during early 1990s since brick was the easiest material for modern constructions. But it has happened as hoped. It was built by local artisans; with local stone. It was characterized as a prototype house for Cyclades and it was a low budget story that needed much tenacity and loads of personal labor. It has been more than 50 years since a stone house got built on the island, which is a rock in its entity. Since then the mockery stopped, gradually many stone houses got built on the island, with local stones or with stones coming from the neighboring islands; all Cyclades islands are rocks; the stone was and will be there; it was with stone that people used to built their homes and enjoy all the privileges offered by a stone house, cool in the summer, warm during winter. This stone home became my sanctuary. It is a home with a self-contained guest-home that embraces you as you arrive at it’s lush garden and then, when you pass it’s doors to proceed inside, erasing negative thoughts, filling every inch of your body with joy and a sense of lightness.